Prominent & Leading Exporter from Ambala, we offer kjeldahl digestion unit, kjeldahl distillation unit, table pattern distill water still and kjeldahl distillation & digestion combined. Steel stand and Pair of hangers. 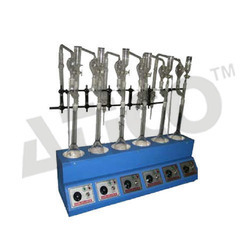 Kjeldhal Distillation Unit offered finds application in performing nitrogen analysis as well as protein determination as per Kjeldahl method. Some of the industry areas where these find usage in include food & feed industry as well as in environmental and chemical industry sectors. The system features body construction in MS that comes duly powder coated so as to provide for optimum functional support. 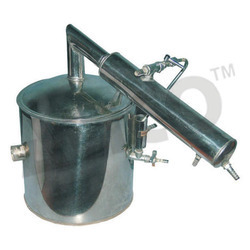 These water distillation plants have been designed to meet with the requirements of best quality of distilled water. These are best suitable for removing all types of impurities Organic, Inorganic, Gaseous, Bacterial and Pyrogenic leaving a final pure distillate. Doubled walled Water Still (Barnstead Type) is made up of Outer MS powder coated and Inner tank made of SS. The gap in between is filled with glass wool. All the fittings such as condenser, top, and outer chamber are made up of Stainless Steel. The raw water is first made to pass around the tubes in the condenser, where it gets heated neatly to the boiling point thus economizing the heating energy. 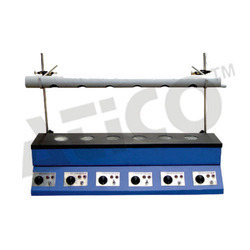 The evaporators are fitted with a set of totally immersed long life heating elements and are easily removable. A convenient drain valve is provided for flushing and easy accessibility to the entire evaporating chamber. The water still is fitted with special immersion element (ISI Marked) with automatic ejection device which stops working in the case of failure of water supply. Operation: The preheated water then passes out of the condenser, gives may out to the gaseous and volatile Impurities in the atmosphere with the help of a special device incorporated herein and finally enters and boiling pan for distillation. The inlet water passing into the stills flows around and outside of the condenser tubes where it becomes per-heated nearly to the boiling point. Kjeldahl Distillation & Digestion Combined is used for both distillation and digestion purpose. 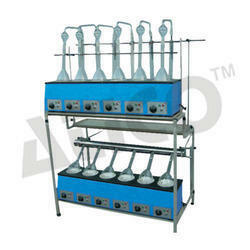 Supplied with Two heating boxes, Brass Condenser Rack, Tubular stand, Fume duct and Pair of hangers. Looking for Laboratory Water Distillers ?